Why Does the August NFP Report Matter? What the heck is the NFP about? If there’s one U.S. economic release that you should pay close attention to, it’s the non-farm payrolls report or the NFP. Simply put, the NFP figure indicates the net number of employees hired for the month. A positive reading means that the labor sector added jobs during the period while a negative reading means that jobs were lost. As an indicator of the U.S. jobs situation, the NFP gives market watchers an idea of how the U.S. economy could fare in the near term. Increased hiring and a stable jobs outlook hints at upbeat prospects for growth and spending. Why is the August NFP release important? Much has been said about the importance of the non-farm payrolls report, but this particular release for the month of August could be crucial in making or breaking the dollar’s trend. Remember that this release comes right before the Fed’s September monetary policy statement, during which policymakers are expected to make a decision on whether they will scale down their current easing program or not. Based on the minutes of the previous FOMC meeting, policymakers are comfortable with Bernanke’s plan to reduce bond purchases if the U.S. economy shows significant improvements. In particular, they are monitoring the progress in the labor sector to figure out if the Septaper will push through. A strong jobs figure and consistent gains in average incomes might convince policymakers that the U.S. economy will be able to stay afloat despite the risks that loom on the horizon, such as potential budget cuts and higher taxes. This week Bloomberg’s median estimates puts the August NFP at 180,000, while a Thomson Reuters poll sees the payrolls at 175,000. If you remember, the actual NFP for July came in at 162,000 against the 182,000 figure that many were expecting. Let’s see how that played worked out for EUR/USD and USD/JPY. Back then, traders were already looking at the NFP to see whether or not the Fed would have more reasons to taper its asset purchases. 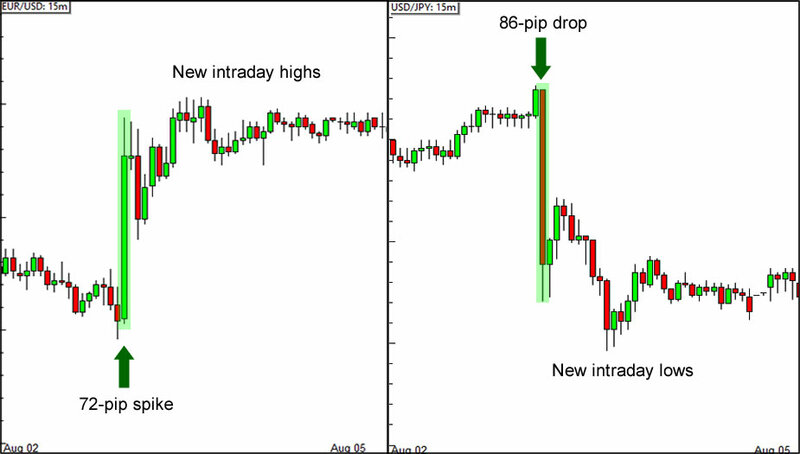 This is probably why EUR/USD jumped and USD/JPY got sold off heavily when the NFP report missed its expectations. With this month’s release closer to the Fed’s September meeting, we’ll probably continue to see a direct correlation between the NFP and the dollar’s performance. That is, an upside surprise could boost the Greenback while a miss could drag it lower across the board. This doesn’t mean that you should just sit back and wait for the actual NFP report though. Remember that employment-related reports like the Challenger job cuts, the ADP non-farm employment report, and the ISM non-manufacturing PMI are due today. Traders sometimes look at these reports to determine the direction of the NFP, so we could see positioning ahead of the actual release. On a related note, don’t forget to watch out for a possible buy-the-rumor-sell-the-news scenario on the dollar pairs! Will you trade the NFP report tomorrow?